Ask Al: 4 Burning Bodyweight Questions Answered! Feeling daunted by human flags, toes-to-bar, and strict muscle-ups? You're not alone. 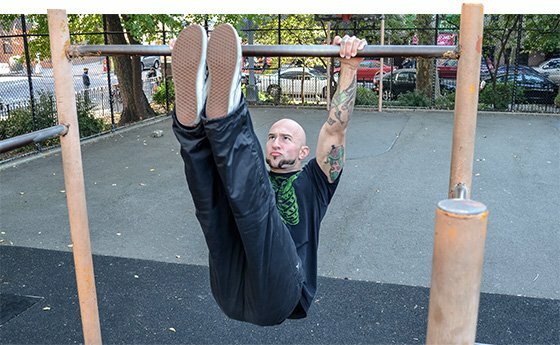 Al Kavadlo has seen it all and can help you troubleshoot your bodyweight work. Have you ever seen someone perform a difficult bodyweight feat of strength and make it appear easy? Perhaps you tried to replicate it yourself afterward and found out the hard way just how difficult it really was. This type of humbling experience can make you re-examine your very definition of strength! 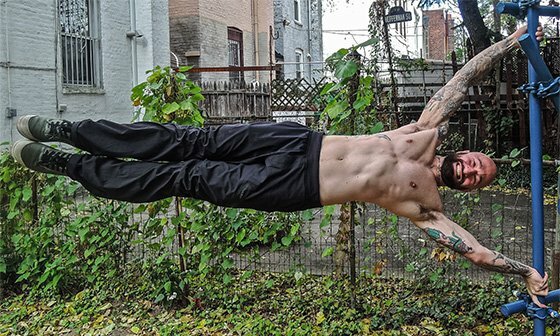 Advanced bodyweight exercises are often as much about using leverage and technique as they are about raw power. Other times, the limiting factor is mobility or coordination. Regardless, high-level calisthenics generally require levels of skill and precision that only come with dedicated practice. In this installment of "Ask Al," I address some of the bodyweight exercises and feats of strength that I get asked about the most. I am a 27-year-old female, and I&apos;ve been working out my entire life. I&apos;m stronger than most of the guys I know and I can do lots of pull-ups and push-ups. My new goal is to train to do the human flag. Do you think this is possible for a woman? I&apos;ve never seen one do it. As women biologically have less upper-body strength than men, it&apos;s tempting to think that the move is simply outside of your spectrum of possibilities. There are plenty of videos on YouTube where you can see strong women incorporating a modified human flag into pole dancing, but I&apos;ve never seen these women performing the human flag in its fullest expression: body totally side-on and completely parallel to the ground, with both arms locked with the legs together and fully extended. On the other hand, there are some incredibly strong women out there, and I believe that with enough practice and dedication, just about anything is possible. You might have to work a bit harder to achieve a full human flag than if you had been born with a Y chromosome, but I believe the move is absolutely achievable. I&apos;ve seen a few women come very close to getting a full human flag hold in person during some of my Progressive Calisthenics workshops. When all is said and done, the only way to find out is to try. Go for it! Al, how do I improve my mobility for back bridging? I&apos;m very strong in my upper body but still struggle with this exercise. This is a common concern for guys, especially those who have a lot of upper body mass. When you&apos;ve got lots of muscle, it can often limit your range of motion. Part of what makes bridging such a great exercise is the way it provides a stretch for the front of the body while simultaneously strengthening the posterior chain. Unlike so many conventional gym exercises which can make you tighter over time, the bridge can make you stronger as well as more flexible. For people struggling to get into this position, I recommend starting out with easier bridge variations like the partial bridge or straight bridge, while concurrently doing additional mobility work, like passive bridging performed by lying back over a stability ball and/or the "Wall Dog" stretch seen here. I recently read your book "Raising The Bar," and it helped me achieve my first muscle-up! Only problem is, I&apos;ve been practicing for a few weeks and I still can&apos;t seem to get both arms to go over the bar at the same time. Congrats on the muscle-up! Now that you can consistently do them, it&apos;s definitely time to clean up your form. One thing that&apos;s helpful for learning any new exercise is practicing negatives. It&apos;s a great way to establish a new movement pattern in your nervous system and it&apos;s very helpful for muscle-ups in particular. To do a muscle-up negative, start with your torso above the bar and your arms straight. Slowly lower yourself to the bottom of the dip phase with your chest leaning over the bar. Brace your trunk while you transition as carefully as possible from having your chest above the bar to the top of a pull-up position, making sure your arms move in unison. Be mindful of really squeezing your abs and reaching your legs away from the bar to counterbalance your torso. At first you may not be able to control it much, but with time you will eventually get the hang of moving through the transition with control. Once this happens, cleaner muscle-ups will soon follow. I&apos;ve been working on hanging leg-raises for almost a year following the program in "Convict Conditioning." I&apos;m now able to do 10 reps in a row, and I read that the next progression is to bring my toes up all the way up to the bar. I gave it a shot and I can&apos;t do even one rep! What gives? As you&apos;re discovering, the leap from what I call a "half hanging leg-raise," or one with your legs reaching a height that is parallel to the ground, to a full hanging leg-raise can be a tremendous hurdle. One thing to keep in mind is that flexibility is often a limiting factor. If you can&apos;t touch your toes from a standing position, don&apos;t expect to pull off that range of motion while hanging from a pull-up bar! Another technique to consider is involving more of your upper-body musculature to perform the full hanging leg-raise. Though they&apos;re often lumped in with "abs exercises," hanging leg-raises work the entire body. Squeeze the bar tightly to get the most out of your grip and make sure to engage your lats and shoulders as well. Don&apos;t just think about lifting your toes toward the bar; think about pulling the bar down toward your feet. Have any burning questions for me? Leave them in the comments below and I&apos;ll do my best to answer then next time!